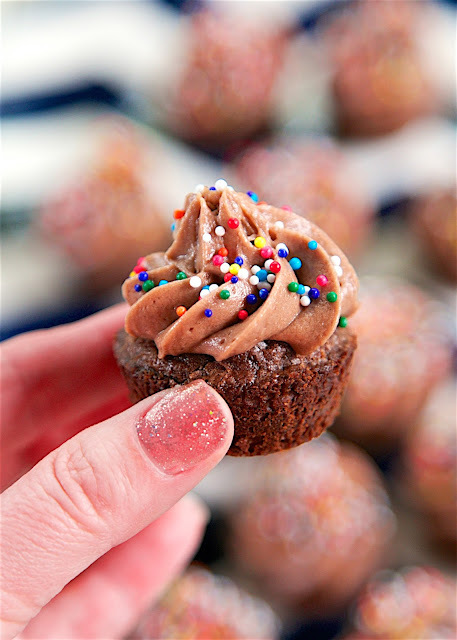 Brownie Batter Frosting - only 4 ingredients to the most AMAZING frosting! Great on brownie bites, cupcakes, cakes or a spoon!! Ready in about 5 minutes. Can refrigerate or freeze for later! 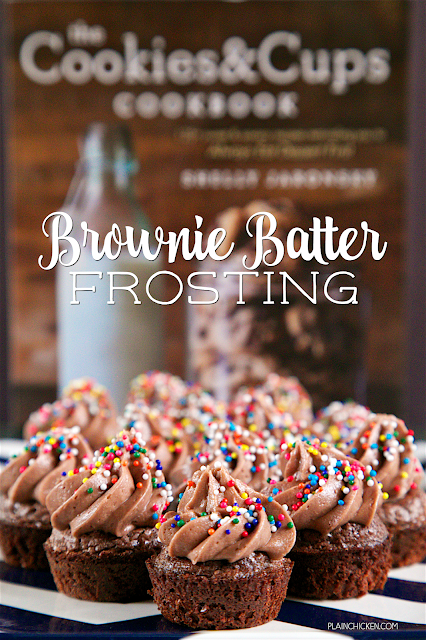 I am SO excited to share this recipe for Brownie Batter Frosting with you! This recipe is from my friend Shelly's brand new cookbook - The Cookies & Cups Cookbook: 125+ sweet & savory recipes reminding you to Always Eat Dessert First. It just came out this week. I couldn't wait to get my hands on a copy! The recipes are simple and delicious. There is also an amazing photo of every single recipe. I LOVE that! I like to know what the recipe is suppose to look like when it is done. I have bookmarked tons of recipes to make. I decided to make this Brownie Batter Frosting first. I love brownies, and I could only imagine how great the frosting would taste. One bite and I was hooked. CRAZY good! I baked up some brownie mix in a mini muffin pan and then topped them with the frosting. I could not stop eating them. SO good. The Brownie Batter Frosting is seriously one of the best frostings I've ever eaten. It would be great on cupcakes, cakes or just a spoon! There are only 4 ingredients and it only took about 5 minutes to make. Can't beat that! In addition to all the amazing desserts, Shelly has lots of great savory dishes in her cookbook too. I have my eye on a Taco Pasta and Frito Pie Sloppy Joes! OMG! I'm getting my stretchy pants out now! In the bowl of a stand mixer fitted with the paddle attachment, mix the butter and brownie mix on medium-high speed until creamy and smooth. Turn the speed to low and add the powdered sugar, mixing until incorporated. The mixture will be dry. With the mixer still on low, slowly stream in the cream and mix until combined. Turn the speed back up to medium-high and beat for 1 to 2 minutes until the frosting is creamy and smooth, scraping the sides of the bowl as necessary. Store airtight at room temperature for up to 2 days, or refrigerated for up to 5 days, or in the freezer for up to 1 month. 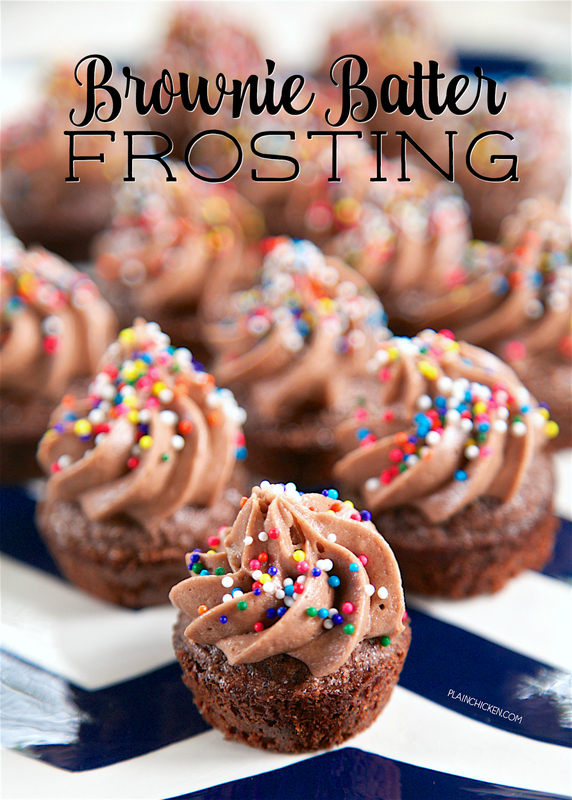 If refrigerated or frozen, allow the frosting to return to room temperature before using. That frosting sounds great thanks for sharing!! I want to make a pan of brownies just so I can frost them with this!! Yes! You must do it. Enjoy! What icing tip did you use?